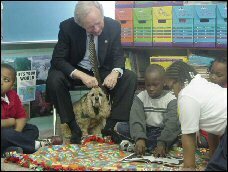 Senator Lieberman honored Mtani (pronounced TAHnee – silent M) as one of CT's Best for his work as a Reading Education Assistance Dog for the program Tails of Joy. Kindergarten teacher Jennifer Faning got the idea to do this when her mother-in-law sent her a picture of a child reading to a dog that ran in a North Carolina paper. 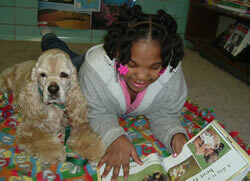 Mtani and his owner, retired kindergarten teacher Daphne Wilcox, have been meeting individually with four first-graders since November to help improve their reading skills. Tails of Joy member Daphne Wilcox and Mtani — which means "special friend" in Swahili were featured in a Hartford Courant article about the R.E.A.D. program. "Mtani and his owner, retired kindergarten teacher Daphne Wilcox, have been meeting individually with four first-graders since November to help them improve their reading skills. The theory is that struggling readers might be embarrassed to read in front of a class or even a teacher but that the dog provides a comforting, nonjudgmental audience.